This is of the reasonably common and popular material mined at Duanzhou in Guangdong province and known as Duanstone or, because it was a favourite material for the making of ink palettes from the Tang dynasty onwards, as inkstone. It is possible that the design and inscription here were both carved by the unrecorded artist, Penghu ke, a hao or assumed art name meaning ‘A Traveller in the Isles of the Immortals’. Penghu was another name for Penglai; it, Fangzhang, and Yingzhou were three mythical islands in the sea inhabited by the Undying. 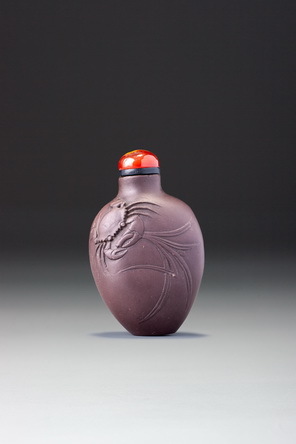 The bottle has a slightly amateurish air to it in the shaping, hollowing, and detailing. An amateurish air was, of course, essential to the literati aesthetic, existing far above the level of the professional and often translated in literati arts into a deliberately unskilled appearance on the surface of the art. Also, what we read today as rather less-than-perfect formal integrity is probably more likely to be the result of minor damage having been repaired. 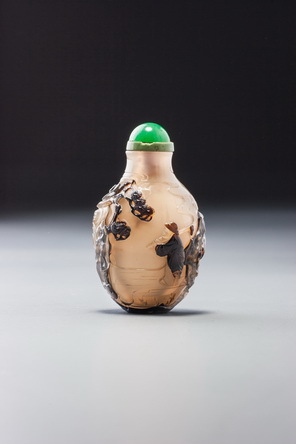 The bottle leans slightly to one side, but if a small chip had been removed from one side of the foot, this could happen and, with a soft stone like this, would have been so easy to correct at conception that it is not credible as an original formal shortcoming. The irregularities at the neck may have occurred for a similar reason. Duanstone is easily worn and damaged, and many old bottles have wear and minor chipping to extremities. We may also assume that the relatively large numbers that have survived represent a much larger original output some of which has succumbed to damage.